Supporting the comfort and effectiveness of long term ventilation by maintaining the natural balance of humidity in the airways. The goal of airway humidification is to maintain and support the normal physiological environment in the airways. Healthy individuals breathing in ambient air, e.g. 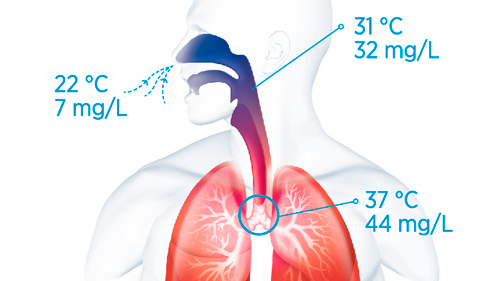 22 °C, 7 mg/L, warm and humidify the air to an average of 31 °C, 32 mg/L with nasal breathing at the pharynx and 37 °C, 44 mg/L in the lung1. 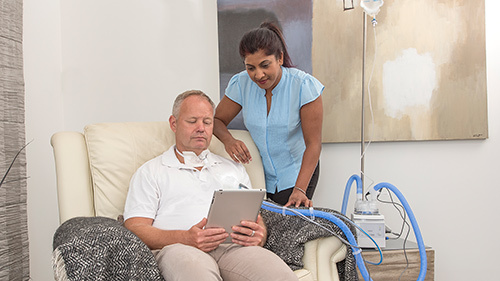 The F&P 810 Humidification System is designed to deliver physiological humidity, with the aim of making noninvasive ventilation (NIV) a more comfortable experience, increasing tolerance and avoiding complications. 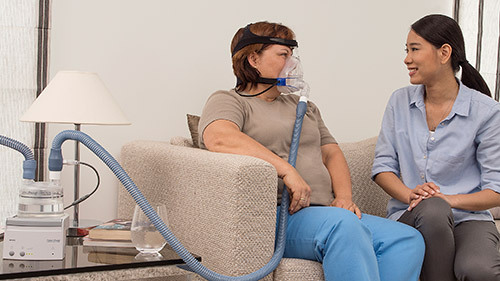 Bypassing the natural humidification systems in the upper airway, for example with a tracheostomy, means that a patient’s airways become less efficient at warming and humidifying gas. Bypassed airways result in impaired sneeze and gag reflexes, meaning that the principal remaining line of airway defense is the mucociliary transport system. The F&P 550 System is designed to deliver Optimal Humidity (37 °C, 44 mg/L), with the aim of preserving mucociliary function and mimic the physiological levels of humidity in the lower airway. Products in this section of the website are intended for use in Long Term Care Facilties and the home. Primiano FJ, Saidel G, Montague FJ, et al. Water vapour and temperature dynamics in the upper airways of normal and CF subjects. Eur Respir J 1988;1(5):407-14. Williams R, et al. Relationship between the humidity and temperature of inspired gas and the function of the airway mucosa. Crit Care Med. 1996;24(11):1920-9. Review. FPH, Mucociliary Transport Videomicroscopy DVD. 185045505 Rev B.